Having recently achieved NORSOK approval for its Alloy 625 hot isostatic pressed (HIP) products Sandvik will showcase its extensive expertise in the production of complex components for oil & gas applications, using powder metallurgy HIP technology, on its booth at ONS 2016. In many oil and gas projects the NORSOK qualification is a prerequisite, the only options being to use other manufacturing methods, such as forging where there are few qualified operators, or to seek a complex deviance. “Working with Sandvik makes the process straightforward and can accommodate the most complex of designs using HIP technology,” adds Petersson. Hot isostatic pressing facilitates the manufacture of products with irregular shapes and complex geometries such as subsea wye pieces, manifolds, tees, swivels, valve bodies etc., to near-net-shape. Costly operations such as machining and welding are greatly reduced, process safety improved and material properties enhanced. It also results in products having isotropic properties, the ability to withstand complex multidirectional loads, contributing to a lighter, more precise and stronger product. Sandvik advanced metal powder technology is available in a full range of stainless steels, duplex and super-duplex material grades. These offer excellent resistance to corrosion and hydrogen induced stress cracking (HISC) making them ideal for subsea offshore oil and gas operations. “Sandvik’s industry-leading metallurgical competence can help create unique customer value, setting industry standards in powder metallurgy based applications,” concludes Mats Petersson. HIP product examples will be displayed in the Swedish Pavilion, Booth 6, at ONS 2016. 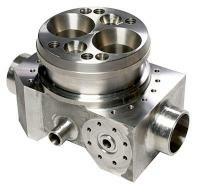 The HIP products are part of the wide Sandvik portfolio of advanced materials for the oil and gas industry. Sandvik works with all major oil and gas companies and fabricators to solve challenges relating to deep, hot and sour wells where corrosion, cost-efficiency, weight savings and safety are critical.